Here are two ways you can make an entire project unbillable. The quickest way is when you create a project. 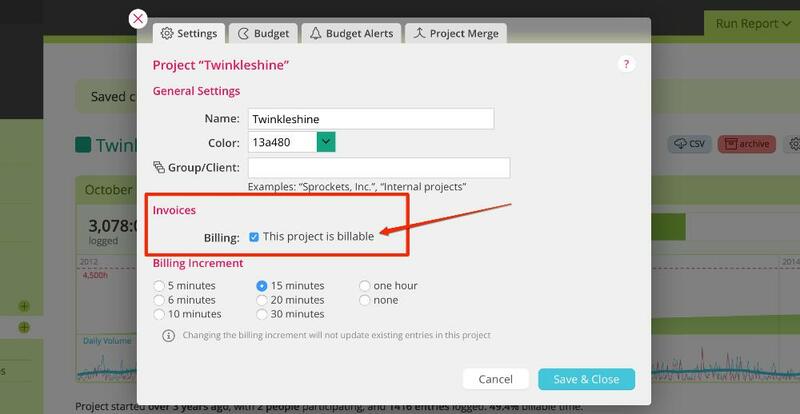 Typing an asterisk (*) after the project name in the PROJECT field of your Quick Entry box will automatically make your new project unbillable. Click on Projects in the green navigation sidebar. Mouse over the project you want to make unbillable and click on the settings button. Check or uncheck the This project is billable checkbox. This is located under the heading Invoices. Projects that are unbillable are automatically excluded from invoicing. There won't be an invoices section on the project page, and you can't create invoices that contain entries from this project.